Like clockwork, the yellow flowers of the Canola plant started appearing furtively in the Swellendam region. The oil is pressed from tiny brown seeds found in pods on the Canola plant. Canola plants grow to approximately one metre high and are unique to the Overberg region; from Caledon to Heidelberg. Optimum night temperatures and the cool sea breeze make this region perfect for the cultivating of this plant. The name Canola had its origin from Canada where rapeseeds were naturally bred to canola in the early 1970’s. Canola, however, is NOT rapeseed — their nutritional profiles are very different. Traditional plant breeding methods were used in the 1960’s to eliminate rapeseed’s undesirable euricic acid and glucosinolates. Canola Oil has less than 2% euricic acid and less than 30µmol/g glucosinolates. 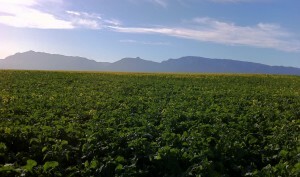 In 1993 the first Canola seeds were planted in the Southern Cape. Three years later, in 1996, Southern Oil Ltd Refinery was built. Harvesting takes place in October/November. Remember that the annual Canola Festival is taking place in Swellendam at the beginning of August and an impressive line-up has been arranged for the weekend of 5 & 6 August 2011.